A stone inscribed with ancient Hebrew script has been recovered by the Smithsonian Institution during an official archaeological dig. It recently underwent scientific analysis by American Petrographic Services of St. Paul, Minn., providing the first scientifically verified evidence of the Hebrew language dating into Book of Mormon time frames in the Americas. 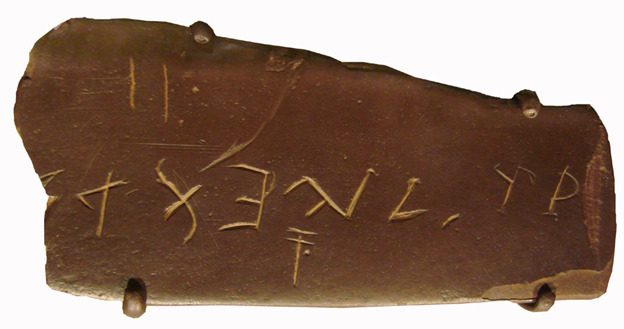 Read the full article, "Hebrew Written Language CONFIRMED in Hopewell Mound in Tennessee." Latter-day Saints should know about this astounding new evidence of the Book of Mormon. Learn why Fox News host Glenn Beck exclaimed “I was blown away” by this research. Watch it on clip #24 of FIRM Foundation's video gallery. A recent History Channel documentary, Who Really Discovered America, investigated the Book of Mormon account of Lehi’s voyage to the New World. Unfortunately, the show’s producers were misled by speculation that Lehi’s route took him to the western shores of Mesoamerica. Oceanographers used sophisticated ocean current data to demonstrate that a voyage from the Saudi Arabian peninsula to Mesoamerica would require 580 days, nearly two years, which lead them to conclude that while a ship could make such a journey, it would “arrive with dead people” because of the impossibility of storing enough water and food for such an extended duration. In stark contrast to this unsubstantiated route, which is used to promote speculative Mesoamerican theories of the Book of Mormon, a recently completed voyage in a 600 B.C. (Lehi era) replica Phoenician (or Israelite) ship has now demonstrated Lehi’s ocean voyage and route. These non-Mormon explorers sailed around Africa to North America in less than six months. Explore more about this incredible expedition and how the new Heartland model geography is providing unprecedented evidence of the Book of Mormon by reading "Lehi’s Voyage Demonstrated: The Phoenicia Expedition" on the FIRM Foundation website. See the ships construction and voyage on clips #16-23 of our video gallery. This article is sponsored by FIRM Foundation/Legacy Research.